A minimum of three years of related expe- rience is required. One must have excellent communication, interpersonal, problem- solving, analytical, and organizational skills. Applicants must be able to work well alone and as part of a team. Proven leadership skills are a must. Security clearance or the ability to obtain one is required. Candidate will be required to complete a background/ drug screening. US Citizenship required. Please apply to the URL provided or on our website http://www.gryphonlc.com/Careers/ fi rst-assistant-engineer/. Academy prepares young women and men for exciting and rewarding careers on land and sea. Our graduates have been at the very top of seagoing, engineering, environ- mental, and international business professions. For information about this positions and how to apply, visit the employment quick link on our web page at www.maritime.edu. 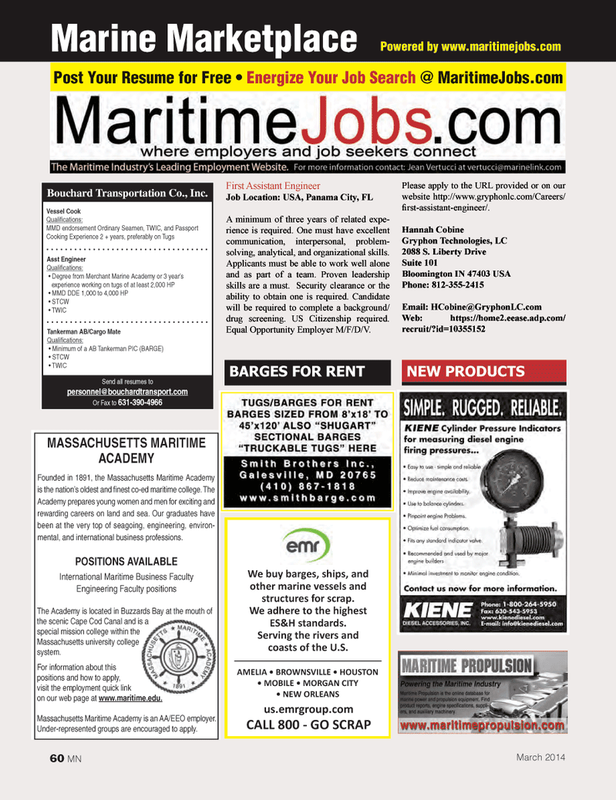 Massachusetts Maritime Academy is an AA/EEO employer. Under-represented groups are encouraged to apply.